On Saturday June 14 from 2:00 PM - 2:40 PM we will celebrate Andy’s life and ministry as part of our Conference’s Annual Meeting. This will not be a memorial service, but rather a time to remember and share what we learned from Andy about faith, generosity, and making God’s love and justice real. If you or your church were touched by Andy’s ministry, you are welcome to attend this portion of Annual Meeting, regardless of whether or not you’re a delegate. We expect to have about 150 extra chairs for this part of the meeting for non-delegates who want to honor and remember Andy’s life and ministry. No registration is necessary. However, we are not able to provide lunch for non-delegates. Arrangements: Calling hours will be held Tuesday, June 3, from 5:00 to 8:00 PM in the Fellowship Hall of Townsend Congregational Church, 3 Brookline Street, Townsend, MA. A Funeral Service will be held Wednesday, June 4, at 4:00 PM at the church. A public worship service to celebrate Andy's life will also be held as part of the Conference Annual Meeting, being held June 13 - 14 at the Sturbridge Host Hotel and Conference Center in Sturbridge, MA. Specific details will be announced soon. I write with a very heavy heart. Our friend, colleague, inspiration, mentor and beloved brother in Christ, Andy Gustafson, passed away peacefully earlier today. Andy was surrounded by God’s love and his family. Our ACM Ellie Richardson was also able to be at his side. Andy had been home from the hospital for a few days and attended to by hospice. At this time, plans for a memorial service to celebrate Andy’s life - for his church community, family and friends - are not yet in place. As they become available, look for further details in this space. I will also share with you plans for a public worship service to celebrate Andy’s ministry at the Massachusetts Conference once they are in place. These plans may not come together until next week. Words fail us at times such as these but God does not. So we turn to God to give thanks for Andy’s life and ministry and to seek the comfort of the Holy Spirit for our hearts and souls. 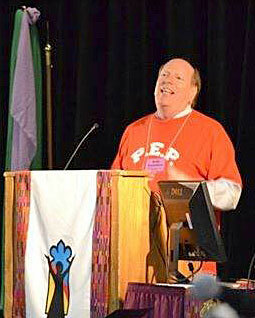 Andy was named Associate Conference Minister for Stewardship and Financial Development in July of 2004. Andy was a lawyer, and before coming to work for the Conference he concentrated his practice on advocating for handicapped, poor, and marginalized children. He was known in the Massachusetts Conference for his quick wit, and took part in "stump the steward" games at several Annual Meetings, where he invited anyone to read him a Scripture passage - any passage - and he would explain how it related to stewardship and generosity. He never failed to come up with an answer. He leaves his wife of 25 years, Carole S. (Jordan) Gustafson; two daughters, Laura Ashley Gustafson, Holly Elizabeth Gustafson both of Townsend; a brother and sister in law, Lawrence and Shelley Gustafson of South Hadley; a sister, Karen Gustafson of Stuart, FL; a grandchild, Avari Senneville; a nephew and several nieces. In 1987, he was predeceased by his first wife, Priscilla (Morgan) Gustafson, his son , William A. Gustafson and his daughter, Abigail M. Gustafson. This saddens me beyond words. Andy was a man of God. He edified me. Very saddened to hear this. My strongest memories of him are when he along with Peter Wells would lead the MACUCC delegation breakfasts at General Synods in a spirit-filled and entertaining manner, designed I'm sure to wake us all up at 6:30 AM! I also have first hand knowledge of stewardship and finance related assistance he has provided to our churches. So very saddened. Andy was the best. I am Overwhelms with grief! He lived his faith out loud and I am grateful for all He taught me. He will be sorely missed. There is no doubt he is hearing the words today: Well Done My Good And Faithful Servant! So sad. Such a loss. I am so grateful for all he taught me and my congregation. Prayers of peace and love for all who's lives were touched by this inspirational leader. I add my prayers and my tears to the news of Andy's passing. I don't ever recall him without a smile, an encouraging word, or a plan. Andy, we have learned much from you and you will be sorely missed! A sad time for me and for our churches. His life was joy-full and he spread that joy around. Never cared how silly he looked in pirate gear or how we roared at his arrgghh. Kind, gentle, always willing to explain, listen, explain, listen, work it out. Lived into godliness. Extraordinary man. Rest. Our heartfelt sympathy to Andy's family and to all the MACUCC staff and friends. We are with you in sympathy and prayer. From your brothers and sisters at the Canaan Congregational Church and the Berkshire Association. Dear, sweet Andy. So humble and such a great encourager of others. My brother, hope you are free, and see face to face. What a Spirit-filled soul. So humble, so insightful, so faithful. What a joy to be in his presence. Deepest sympathy to Andy's family and the Mass Conference. Andy leaves a big hole in the Conference and in our hearts. He loved the church and the church loved him back. Sweet prince. Go in peace. Just a good, Godly, humble man. Godspeed Andy. One of God's true saints! And a painful loss for the time-bound aspect of the church. Friend,Colleague, Counselor, Inspirational, Funny, Boss......I am so sad at his long trial with Cancer to final passing. Andy and I had many meetings about churches that needed capital campaigns, and shared many joys with those churches when they succeeded, with the help of God. One church leader said "I felt the fingers of God throughout this whole process." I can truthfully say I felt the fingers of God throughout Andy in his entire time with us all. Welcome to a new Joy, Andy. Back home you go, Andy: to Love, to eternity, to the Great I Am. Thanks for all that you were and are - a glimpse of the enormity of God's grace. So heart-breaking to hear of this loss this morning. Tears falling like rain. He was a caring soul. Oh God, Peace be with the leaders of the MA conference and those whose lives intersected with Andy's. What a gentle soul. O Andy, you are such an amazing person in so many ways that it is very hard to let you go! May Carole and all your family, friends, and colleagues feel God's embrace and the embrace of all those who love you. Now you are reunited with God and with your beloved Priscilla, Abigail, and William. Rest in peace, dear brother. I am very saddened by the news of Andy's death. He was such a positive person and a gentle soul. A true example of discipleship that we should all seek to emulate. Saddened to hear this news. Rest lightly in the palm of God's hand Andy. Sending prayers and strength to Andy's family and the church family near and far. A man of true grace, humor, patience and intellect. An exemplary Christian. Peace, Andy. WE have lost a dear wonderful and soul filled man. Andy had a heart of compassion and exemplified the work of the UCC Church and of Christ. Sending prayers and comfort to Carole, family and the TCC community. Andy was a man who brought his deep compassion and quiet care to all he met. I am grateful and thankful to have met him. I will always remember Andy as a gentle soul, someone who reverenced the Spirit in others. Thank you, Andy, for your faith, your exuberant spirit, and your ministry. Your help and guidance have been invaluable. Eternal love and peace be with you. Those of us in the stewardship world who worked with Andy know that he truly walked the talk. He was a man of extravagant generosity of self and spirit. He will be sorely missed. My sympathy goes out to all who knew and loved Andy. I will always remember Andy as a truly good man who was faithful and full of enthusiasm and joy. My prayer this day is that Andy has entered the healing and the joy which God has prepared for all who love God. Praise be to The God of The Ages for giving us a great soul. The former Executive Council of the now closed North Congregational Church, UCC of Amherst, MA shares in the great sadness of all who are learning of Andy's passing. Without Andy's steadfast support, information, encouragement and genuine concern for our church and its members, we could not have brought the closing of North Church to a positive and meaningful conclusion. He stood by us in our most difficult times and helped us know the true meaning of giving. Andy became part of North Church even as we prepared to turn the keys over to another faith group. We are thankful for the opportunity to get to know Andy and for his commitment to helping us through the final chapter of North Congregational Church, Amherst. Andy blessed all who ever knew him. He embodied the love and strength of Christ, strengthening the faith of those around him, including my faith as we help lead TCCUCC through some challenging years. I will be ever grateful that God placed me in Andy's church even as I cry for the loss we are all suffering. Heartbroken. Truly of man of faith who ministered not only with his generosity, but with his very humble presence. He and Susan both have created family at our conference. Their ministry and love will bless us well beyond our aches and tears. I am grateful for the opportunity I had to get to know Andy and his gentle spirit while I served on the Stewardship Commission. He taught me more about stewardship than anyone I've known. Andy was one of the most joyful, loving, and genuine people I have ever met. I am honored that I was able to work with him for 7+ years. Sending love to colleagues and of course, Andy's family whom he loved deeply. Andy gave so fully to all he did and with such a joyous spirit. I can hear the words that greeted him as he took his last breath, "Well done, good and faithful servant."